I need to write a little bit about monotype casting. 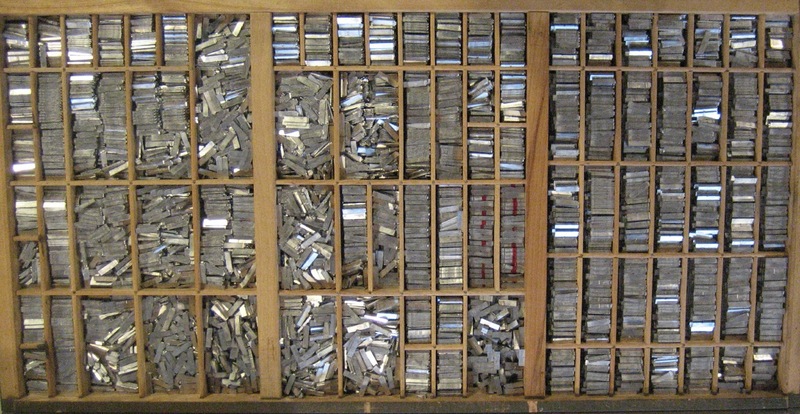 One aspect of my fellowship at the Wells Book Arts Center is that I work at the Bixler Letterfoundry once a week. Michael Bixler has been working for many years in monotype casting and composition. I have never met anyone quite like Michael. To give you a sense of that kind of man he is, I will tell you that he letterpress prints his syllabus and quizzes for his letterpress 1 class. On one of my first days of working at Michael's shop, he asked me to reassemble a border of ornaments that has been pied (dropped). Michael gave me the broadside (pictured below) as the pattern to work from as I re-set the boarder. As I work on the boarder, we talk about the broadside. 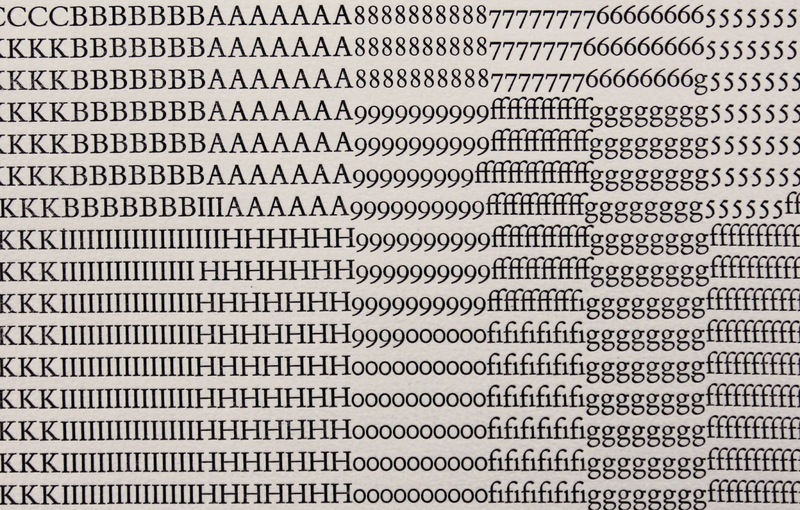 And I begin to understand that Michael thinks and sees letters primarily as physical objects. He wrote the text for this specimen sheet, considering the space each letterform takes up in the bed of the press. Perhaps you are not familiar with monotype casting? It is a mechanized system for casting individual letters, in a particular order. However, in contrast to linotype casting, it is flexible for making corrections before printing. As stated on the Bixler Press and Letterfoundry website: "Linotype was meant for speed, but monotype was meant for perfection." 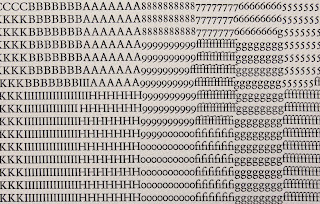 The monotype keyboard uses a binary system of punching holes on a paper ribbon, as the text is keyed in. The paper ribbon is attached tot he caster--air is pushed through the holes in the paper, which tells the machine where the letter is located on the map. Hot lead is forced into the letter mold and finally the letter is pushed out onto the galley tray. I have become very interested in the physicality of type and the limitations of a type case. 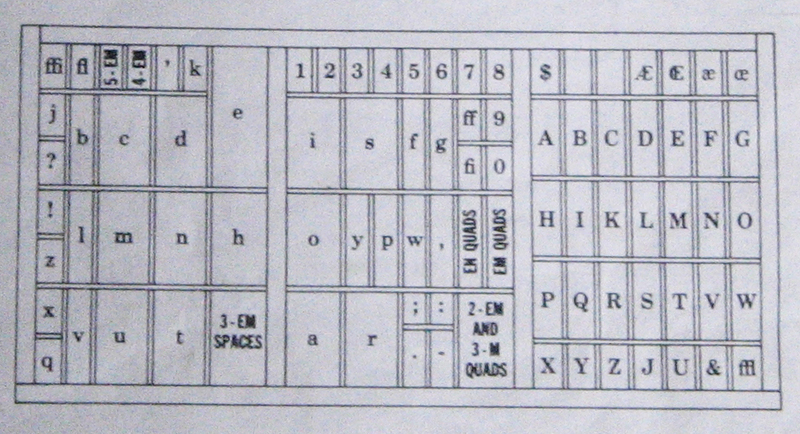 Each compartment can hold only so many letters, however the possibility for word composition is seemingly endless. I decide to cast my first case of type: 14 point Bembo. Freshly cast 14 point Bembo. The lay of the case. 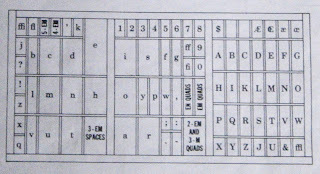 The map (pictured above) shows which compartments in the case hold which letters. I have the idea to set all of my 14 point Bembo in the bed of the press and print it. I am not sure that it's going to work--so I just start. It is surprising to me how perfectly all the letters fit into the bed of the press. Here's a detail of the printed text. 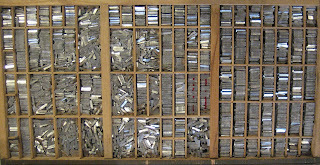 Specimen of Bembo, 2012, cast and handset type, letterpress printed, 15 x 22.5 inches. As I look at the final image, I am pleasantly surprised at how architectural this overall image looks. Something that I wish to share is that Michael things that this project is totally crazy. For example, I didn't use any line leading. He would ask me: but without leading, how did you set it? How did you print it? And I would say: I don't know I just did. And then we would both chuckle--he would shake his head. That is the interesting thing about treading into some of these deep dark areas of craft: things that don't see crazy to anyone else in the artwork, are absolutely outlandish to a master-caster.